Who can you trust with the care of your pet? Cane Bay Pet Sitting & More Practice: We keep regular office hours from 8:00 AM to 5:00 PM Monday through Friday and Saturday 8:00 AM to 12:00 Noon. However, calls made during business hours will be answered live or returned within 2 hours. Calls made outside of business hours will be returned within 24 hours. Our pet sitting service hours is 6:00 AM to 9:00 PM daily. 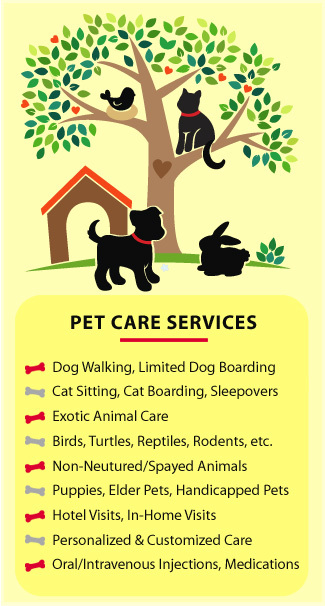 Any requests to take care of your pet outside of our daily service hours will be surcharged $10.00 per occurrence. VIP package and Limited Home Boarding is excluded. Cane Bay Pet Sitting & More Practice: 24 hours is, of course, a really great response time, but we prefer to go above and beyond and usually respond within a couple of hours during office hours and 24 hours during non-office hours. Can Bay Pet Sitting & More Practice: When it comes to our practice, we have no pre-set requirements. If you have a travel emergency and need to leave town, we have the ability to handle your last-minute request in a headache free fashion. We go above and beyond – this is how we conduct our business. Does the pet sitter (or agency) have established fees for pet care they quote over the phone and/or in company literature? Cane Bay Pet Sitting & More Practice: Our fee structure is readily available on this website (just click the “Pricing” tab above). However, none of our prices are actually set in stone and we recognize that different animals require different kinds of care, that’s why we remain highly customizable and personalized and will adapt to any situation to find the perfect solution to make certain your pet is properly cared for while you’re away. Cane Bay Pet Sitting & More Practice: Every single one of the pet sitters on our team is completely insured and bonded through Business Insurers of the Carolinas. If you would like to read more about our coverage in detail – and even download PDF versions of our certificates – just click the “Insured and Bonded” tab above. How much advanced notice must I give before making my reservation? PSI Suggests: Initial interviews allow the pet sitter to meet with you in your home, interact with your pets, and discuss services and business policies. These visits are highly recommended for both pet owner and pet sitter. Some pet sitters offer this service at no charge, while others charge a nominal fee for their time and travel expenses. Cane Bay Pet Sitting & More Practice: We want to ensure your pet and our sitter get along swimmingly, that’s why we offer complimentary play dates and meet-n-greets for all of our services. This provides a chance to get to know the sitter in person either in your home or the sitter’s home (depending on where the care is taking place). We also require absolutely no commitment before you meet the sitter. Cane Bay Pet Sitting & More Practice: We ensure that our pet sitters have ample experience caring for a plethora of animal types with a variety of needs from medical to emotional. We are also NAPPS Pet/First Aid Certified. We know how to administer medication and shots as well. You will always be in good hands with us! PSI Suggests: PSI recommends that all of its members have a list or references for potential clients to contact. Cane Bay Pet Sitting & More Practice: We love it when people ask for our references, because they have so many great things to say about us! 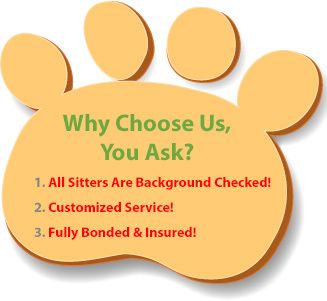 Each of our sitters comes highly recommended and have their own list of client references. Feel free to ask for a call or email from a satisfied client who will speak to you directly on the pet sitter’s behalf. Cane Bay Pet Sitting & More Practice: We have a detailed, comprehensive service agreement that we ask clients to fill out and return before they leave. This allows us to get all the necessary information for us to care for your animal in the best way possible. Within our agreement, there is a place for contact, vet, emergency information, special instructions, and your pet’s likes and dislikes. PSI Suggests: the average in-home visit to care for one pet is 30 minutes, but additional time may be required if you request special services such as dog walking, pet grooming, etc or have a multiple pet household. 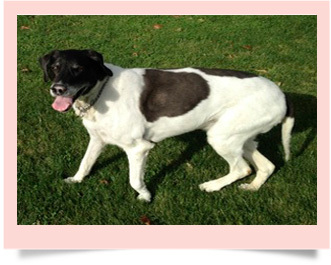 Cane Bay Pet Sitting & More Practice: For pet sitting, our standard visit is 30 minutes. Visits that include a 20 minute dog walk is 40 minutes and we always guarantee the sitter will be there the entire time, keeping your furry friend company with all the love, playtime and affection they can handle. We’ll also make sure your home is in better condition than when you left it! You also have the opportunity for the sitter to stay in your home the entire time you’re gone with our VIP Package. What contingency plan does the pet sitter have in the event of inclement weather or natural disasters while caring for your pet? PSI Suggests: Every professional pet sitter should have a written Disaster Plan that addresses natural or man-made disasters, as well as contingency plans to provide for your pet’s care if anything prevents the sitter from completing the assignment. Cane Bay Pet Sitting & More Practice: Each animal loving professional is prepared to go above and beyond the call of duty. If unfortunate and unforeseen circumstances prevent your usual sitter from making their daily visit, we will make absolutely certain someone qualified is there to take care of your animal with no disruption to their daily routine. Cane Bay Pet Sitting & More Practice: We always require the vet name and address where your pet’s records are kept. We also create relationships with trustworthy emergency veterinarians who are available 24/7 for house calls and practice internal medicine, surgery, vaccinations, and more to ensure that, no matter what, your pet is safe and taken care of. PSI Suggests: Some pet sitters require payment in full for first time customers while others require a deposit upon reservation and balance paid at the end of the assignment. There is no industry standard for payment terms, so be sure you understand in advance the terms of the agreement. Cane Bay Pet Sitting & More Practice: We accept cash & checks, PayPal and all major credit cards. Our policy is for all service payments to be made prior to service commencement on each occasion. After your initial in-person meeting with your sitter, payment in full of the total is required, to hold your reservation. Cane Bay Pet Sitting & More Practice: Each of our pet sitters passes through a rigorous screening process before they are even invited to join our network of sitters. Not only that, they all undergo an advanced interview and this interview is conducted in the pet sitter’s home to access if they have the necessary environment to ensure pet safety. We also perform comprehensive criminal, credit background checks and drug testing to make sure only the highest quality individual joins our network to represent our company. During the in-home interview, does the pet sitter exhibit a positive attitude and seem comfortable and competent in caring for your pet(s)? PSI Suggests: A positive attitude goes hand-in-hand with experience when it comes to in-home pet care. As a result, you can feel at ease and look forward to the in-home pet-care that a professional pet sitter provides. Cane Bay Pet Sitting & More Practice: From the minute you get in contact with one of our sitters, you will be met with an upbeat attitude and a positive countenance. All of our sitters go out of their way to assure you feel at ease and comfortable with their services, treatment of your pet, and treatment of your home. Of course, the end result always comes down to your personal experience, but most people find that they really enjoy our sitters and feel at ease during complimentary play dates.